The termvisual text analytics describes a class of information analysis techniques and processes that enable knowledge discovery via the use of interactive graphical representations of textual data. These techniques enable discovery and understanding via the recruitment of human visual pattern recognition and spatial reasoning capabilities. 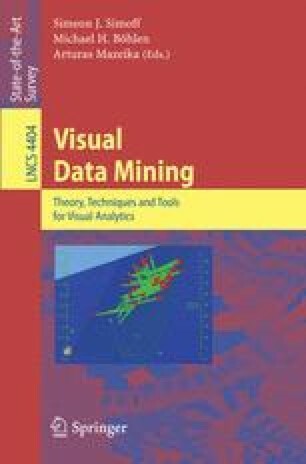 Visual text analytics is a subclass of visual data mining / visual analytics, which more generally encompasses analytical techniques that employ visualization of non-physically-based (or “abstract”) data of all types. Text visualization is a key component in visual text analytics. While the term “text visualization” has been used to describe a variety of methods for visualizing both structured and unstructured characteristics of text-based data, it is most closely associated with techniques for depicting the semantic characteristics of the free-text components of documents in large document collections. In contrast with text clustering techniques which serve only to partition text corpora into sets of related items, these so-called semantic mapping methods also typically strive to depict detailed inter- and intra-set similarity structure. Text analytics software typically couples semantic mapping techniques with additional visualization techniques to enable interactive comparison of semantic structure with other characteristics of the information, such as publication date or citation information. In this way, value can be derived from the material in the form of multidimensional relationship patterns existing among the discrete items in the collection. The ultimate goal of these techniques is to enable human understanding and reasoning about the contents of large and complexly related text collections.